Rachel Warren, head of creative at London’s leading catering company, Rocket, offers on-trend ideas for your wedding. Use our seasonal British plants with roots, fragrance and native beauty. From tangled foliage and fresh greenery to potted herbs incorporated with dried poppy heads, cotton branch, willow – all these ingredients make for a gorgeous table centre or canape tray decoration. Pots can display geographic reference or personal designs / place names or table numbers. They can even be a favour for guests to replant in their garden for memories of their own happy day. MY BAKER, the cake concierge has come up with a unique and fun way to say thank you to guests for attending your wedding & being part of your big day. A bride is always on the lookout for the unusual and unique to add that special “wow” touch to herday. Brides like to hear a compliment or chatter of appreciation from their guests. Having spent a year preparing for your wedding, it’s the small things that you will remember and the finishing touches that really make it. Why opt for a vegan wedding? As World Vegan Month draws to a close, Vows &Venues find out more about vegan wedding options with the team at Best Western Plus Mosborough Hall, the luxury Sheffield wedding venue. Catering at a wedding and ensuring that the wedding party and guests are 100% happy with the food choices is one of the most difficult parts of a wedding. Ask any wedding couple and they will invariably say that choosing a food menu that suits everyone is one of the most difficult parts of the day. That’s why we’ve seen lots of couples requesting a vegan menu in the past 12 months, and it seems this this a trend that’s here to stay. Read more about Why opt for a vegan wedding? Michelle Marwood, Events & New Business Coordinator, at award-winning wedding venue Hylands House, Essex gives us some sweet ideas for making a wedding breakfast that is just your cup of tea. A wedding breakfast can be anything you want it to be these days from a traditional three course meal to having lots of food stations where guests can help themselves to a variety of different foods. And these days you can really indulge people with an array of cakes. Do you love chocolate and want to include it in your wedding? Do you love chocolate and want to include it in your wedding? Or, perhaps you are a guest who needs a wedding gift but are looking for something really different? Biscuiteers create wonderful, artistic hand iced chocolates and biscuits for an array of occasions, including engagement presents, wedding gifts and wedding favours. Read more about Do you love chocolate and want to include it in your wedding? Jimmy Garcia is a name associated with original, sell-out London pop-ups from the capitals own ski-chalet restaurant The Lodge to the brand new river-side, rooftop BBQ Club coming to the Southbank this summer. Jimmy works on making experiences dynamic but creating delicious food using the finest seasonal ingredients. Couples can bring this innovative dining experience to their wedding guests with JimmyGarcia Catering. Iconic pottery brand Denby offers brides-to-be and wedding guests stylish and timeless tableware ideas to inspire the most sophisticated gift lists. Handmade in England by skilled craftsmen, its premium stoneware ranges have spanned generations, offering special and unique dinnerware that is durable enough for every day. The food and drink you serve at your wedding plays a huge part of your big day. 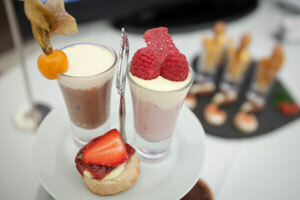 In fact, the catering is likely to be one of the biggest expenses, so it’s vital you get it right. There’s so many choices and options when it comes to wedding food and drink, so how do you pick the right menu for your big day? If you’re looking for unusual cuisine to surprise your guests, reflect your personality as a couple and ensure the catering is remembered for many years to come, it’s time to ‘think outside the box’ and weave some creative spirit into your wedding menu. Venus Bridal, specialists in diverse bridalwear, provides some tips on how to think outside the box for your wedding catering. It's important to be both accurate and realistic about the timings on your big day. Sometimes speeches or photography can run late, so factoring in extra time in the first place can be the difference between a stressful day and one that flows beautifully, just the way you planned. The beautiful Godminster Farm is based on the outskirts of the picturesque town of Bruton in the heart of Somerset. The farm was certified organic in 1999, is home to almost 300 organic dairy cows and boasts fruitful orchards filled with a variety of delicious fruits and herbs which inspire many of the Godminster products. The Godminster Celebration Cheese Cake is a glorious tower of mouth-watering delight, from the handmade organic brie and award-winning vintage organic cheddar to goat’s cheese, with the distinctive heart-shaped Godminster cheddar as the crowning glory. To create the perfect wedding cake, Godminster have teamed up with some fantastic cheese makers, which makes this 10kg and 54cm of pure deliciousness. Those clever Danes have a special word for cosy “hygge” (pronounced hue-gah) – the essence of which is roaring fires, candlelight, good company and a glass of something rich, warming and spicy. Stylish winter brides should look to channel their inner Viking, and fully embrace hygge in their wedding menu design this season. Hunter VIII Hunter is a luxury caterer, specialising in creating bespoke wedding experiences that make excellence accessible as standard. Made up of an experienced and dynamic team of four creatives – chefs, events planners and stylists – Hunter VIII Hunter provides an unrivalled culinary offering with impeccable service, making it the perfect choice for those looking to host the most exclusive and unique wedding celebrations.